Akinwunmi Ambode shakes hands with president Muhammadu Buhari. Ambode hopes that with Buhari’s intervention, Tinubu will withdraw his support for Sanwo-Olu and give him a second chance. The embattled governor of Lagos State Akinwunmi Ambode has just met with Nigeria president Muhammadu Buhari at the Aso Rock Villa in Abuja. Ambode’s meeting with Buhari on Thursday cannot be unconnected with his second term ambition. Pressure continues to mount on Ambode to back down on his second term bid as APC national leader Ahmed Tinubu refused to change his mind on his anointed candidate, Babajide Sanwo-Olu. The sitting governor is ready to fight till the end, and he has continued to devise every means possible to plead with Tinubu. 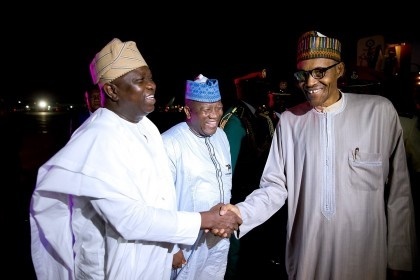 It was gathered that governors under the platform of APC, met on Wednesday night in Abuja, and had on behalf of Ambode, sought the intervention of President Buhari in the APC crisis in Lagos state. According to NAN, the Chairman of the APC Governors’ Forum, Gov. Rochas Okorocha, delivered the governors’ message to the president few minutes before his meeting with Ambode on Thursday.